Great post. 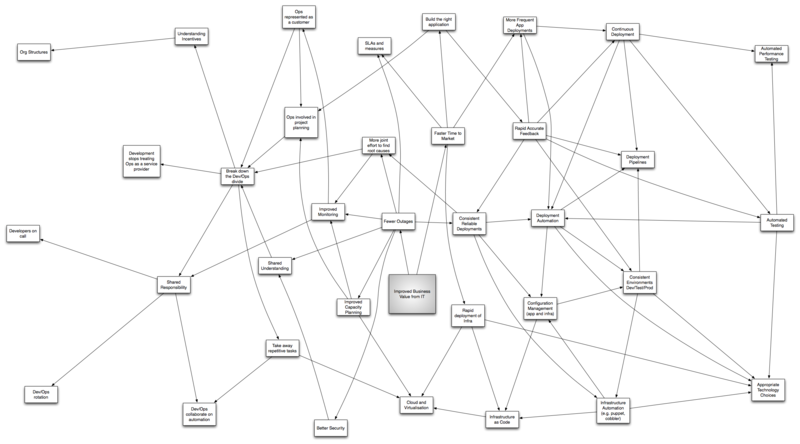 Its nice to finally see those of us who have been juggling development and sysadmin work getting cred with the ‘devops’ movement 😉 Additionally I have found a great deal of use for mind-mapping for practically anything where collaboration is required. Its the perfect ‘agile diagram’. There’s a thinking framework that would be useful in this area – VPEC-T ( Wikipedia: http://en.wikipedia.org/wiki/VPEC-T ). It’s particularly good at surfacing areas of conflicting interest and dealing with them, as well as bringing business values into the whole information systems picture. Have you tried Flying Logic to make these kinds of diagrams? “More frequent app deployments” and “Continuous deployment” need a line to a new concept named “App designed for hot/quick deploys”. Applications can be designed in a way to allow for minimal/no down-time (eg. reference data with start/end times, property file listeners to automatically reload configuration changes, redundancy to allow for live deployments). Thanks Gede – great input. I think that those things are important (live reloading of settings etc) but should not be designed in from the outset (but then I’m an emergent design guy). 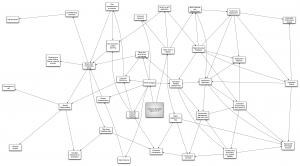 Frameworks like OSGi are compelling, but charge a very high complexity tax. Allowing for fast (and automated) rolling restarts including re-deployment of externalised settings is most important – and as you say this requires redundancy and a simple architecture.